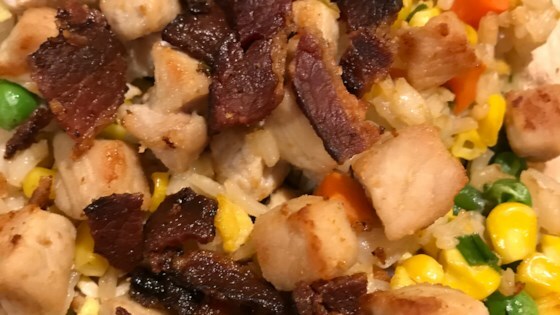 "Bites of pork with rice and vegetables. It takes a while, but it is truly delicious! We buy any cut of pork when on sale and freeze it, this is a way that we can cook it where it is delicious and (sorta) healthy too. I love this because it is so easy to reheat and eat and the kids will eat every bite. Serve with extra soy sauce." Place the bacon in a large skillet and cook over medium-high heat, turning occasionally, until evenly browned, about 10 minutes. Drain the bacon slices on paper towels and break slices into crumbles. Reserve bacon drippings. Bring 1 3/4 cups water and rice to a boil in a saucepan. Reduce heat to medium-low, cover, and simmer until the rice is tender and liquid has been absorbed, 20 to 25 minutes. Beat eggs and 2 tablespoons water together in a bowl. Heat 2 tablespoons reserved bacon drippings in a skillet; cook egg mixture in hot bacon drippings until hard-cooked, about 5 minutes. Transfer egg to a plate and cut into thin slices. Heat remaining bacon drippings in a skillet over medium heat. Cook and stir green onions in hot bacon drippings until tender, 3 to 5 minutes. Pour onion over eggs and return skillet to heat. Increase heat to medium-high and stir pork pieces into skillet. Cook and stir pork until browned and cooked through, 5 to 10 minutes. Stir rice, cooked eggs, and soy sauce together in a bowl. Add corn and green beans; stir. Turn rice mixture out into a casserole dish. Drop pork pieces over the rice mixture and top with crumbled bacon. Cook in the preheated oven until ingredients are heated through and flavors blend, about 30 minutes. You can also shakes the pork pieces in Drake's Crispy Fry Mix® prior to frying. The scale on the amount of meats to veggies is off in my opinion and baking it with fresh rice makes it mushy. absolutely loved this recipe. changed a couple things but still, thank you for helping me learn how to make some great food! I used peas instead of corn, but either one will be great, because the fried rice can stand on its own. It was delicious and I will be making this again, and again.